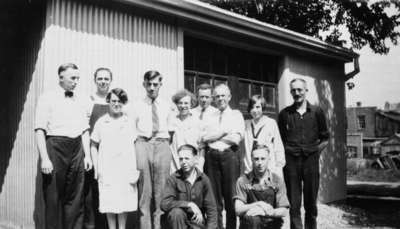 Back Row: Jack King; Tom Seymour; Birdie Augustus; Theodore Blight; Connie Parrott; Wesley Augustus; Eddie Rice; Dorothy Johnson; Robert Harding. Front Row: Orville Gillespie; Len Rich. The Whitby Gazette and Chronicle was a newspaper in Whitby from 1912 to 1941. From 1912-1919 it was published by Charles Albert Goodfellow. From 1919 to 1941 it was published by Graydon M. Goodfellow. The Gazette and Chronicle newspaper office was located at 201 Dundas Street West (at the south west corner of Dundas Street and Byron Street). The building was originally built as a post office. The Whitby Gazette and Chronicle was a newspaper company which joined together two Whitby newspapers: The Whitby Gazette (from 1862-1912) and the Whitby Chronicle (from 1856 - 1912). In 1912, Charles A. Goodfellow combined the Whitby Gazette with the Whitby Chronicle to form the Gazette and Chronicle. In January 1942, the Gazette and Chronicle combined with the Oshawa Daily Times to become the Times-Gazette, and later the Oshawa Times. The Oshawa Times ceased publication on November 5, 1994. This is a copy negative.